Upgrade your factory axles to these forged steel Moser 4-Lug 28 spline rear axles for 1979-1993 Mustang! Heavy duty axles from Moser Engineering seem to be one of the best replacement axles for a Mustang. Among the other benefits, these axles are constructed of forged steel, non-tapered with hardened & ground bearing seats, and feature machined c-clip grooves. They are the perfect upgrade for your street/strip Mustang and will stand up to hard launches at the track! Note: Mustangs with serious power should use 31 spline axles with an aftermarket rear differential. 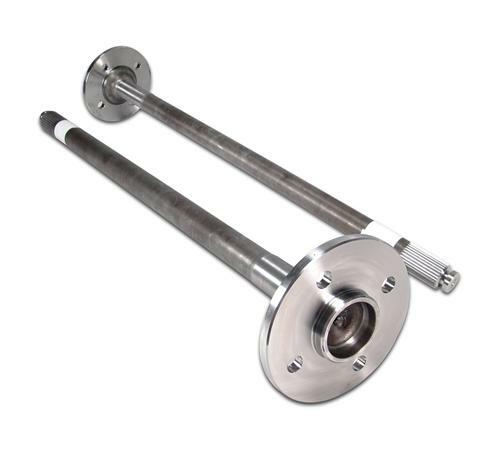 These 28 spline axles will fit both 7.5" rear ends and 8.8" rear ends. Moser - Fast, Strong, Affordable! Moser Engineering, founded in 1982, manufactures aftermarket performance rear end components for various Mustang & Lightning applications. Located in the ‘Heartlands of America’ in the modest town of Portland, Indiana, the company prides itself in its’ ability to supply quality American-made products, at an affordable price, with an industry-leading two-day turnaround. They are widely known for their performance rear axles and differential components. Shop LatemodelRestoration.com to get Moser 4 lug, 5 lug, 28 spline, and 31 spline axles for your Foxbody, SN-95, New Edge, or S197 Mustang.